A YouTube video showing an altercation between Critical Mass cyclists and a driver in San Francisco’s Marina District on Friday August 28, 2015. 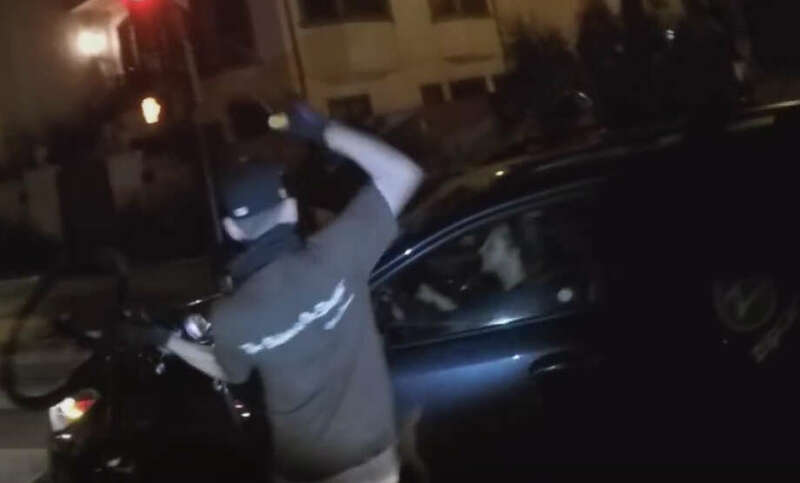 A YouTube video showing a tense altercation between Critical Mass cyclists and a driver in San Francisco’s Marina District, captured a man beating a woman’s Zipcar and smashing her window with a bike lock. The video was purportedly shot Friday night at 8:16 p.m. on Marina Boulevard at Lyon Street during a Critical Mass bike ride. The man’s buddies then swarmed over and surrounded the car. “You ain’t going nowhere,” another man is heard saying. “You f— hit my bike,” the original rider shouted to the driver. “Selfish, b—,” someone else yelled. The cyclists then lectured the Zipcar driver for several minutes while Harvey Danger’s “Flagpole Sitta” blared from a speaker on another cyclist’s backpack. Apparently the driver had enough. She backed up and tried to drive around the pack only to be blocked again. Meanwhile, several other drivers appeared to keep a safe distance back from the altercation. It was unclear if the incident had been reported to San Francisco police. Department officials could not immediately be reached for comment Monday morning.Finally, the Zipcar slowly pushed past the group while one rider landed four blows on the side of the car with a U-lock, smashing the driver’s side window. YouTube user bike42363 posted the video Saturday. It already had more than 13,000 views by Monday morning and was inspiring an enthusiastic discussion in the comments section. “Wow. You guys area pieces of s—for doing that,” YouTube user One TwiztidMunky wrote in part. “It was a protest Einstein,” user drie wiel fired back. Critical Mass is a monthly protest ride that happens on the last Friday of every month in San Francisco. The demonstrations began in the city in 1992 but are now held in nearly 300 cities around the world, according to the organization’s web page.